Season’s Greenings at the United States Botanic Garden –This year, take a train ride across America as the annual holiday show Season’s Greenings showcases train stations! Plant-based recreations of iconic train stations from across the United States will be represented in the train room. Explore classic stations like New York City’s Grand Central Terminal, St. Louis’ Union Station, and many more. Thousands of blooms will be on display throughout the Conservatory, including a showcase of heirloom and newly developed poinsettia varieties. Our collection of D.C. landmarks made from plant materials will return to fill the Garden Court, this year including a botanical version of Washington, D.C.’s Union Station. Celebrate the holidays and America’s railroad history. ICE! featuring A Charlie Brown Christmas at the Gaylord National Resort- ICE! is a signature holiday attraction open Nov. 16-Jan. 1. Watch Charlie Brown rediscover the meaning of Christmas as the beloved story unfolds through two million pounds of ice sculptures and displays. Cirque Dreams Unwrapped will entertain your family in the Atrium, get festive at the Christmas Village which allows you to decorate gingerbread houses, ice skate, enjoy milk and cookies with Mrs. Claus and more. Mount Vernon by candlelight- Join Mount Vernon’s residents and visitors for a festive evening. The experience begins in the Ford Orientation Center, where you can enjoy the sounds of the holiday season and view spectacular Christmas trees highlighting the lives of the Washingtons. After the tour concludes, continue the experience by visiting the Greenhouse and participating in 18th-century dancing, just as the Washingtons might have done during the holidays. Enjoy cookies while sipping warm cider, listening to fireside caroling, and paying a visit to Aladdin the Christmas camel. The evening will conclude with live music in the Education Center Lobby and an opportunity to visit the Education Center exhibits and The Shops. REI thinks spending time outdoors is more important that shopping! They pay their employees to #OptOutside on Friday and invite you to join. Downtown Frederick Partnership in celebrating their 16th annual Frosty on Friday. Help spread holiday cheer with a full day of early and late shopping hours, carriage and trolley rides, caroling & , and fun seasonal activities. Reston Town Center Holiday Parade & The Reston community kicks off the holiday season with a full day celebration including a holiday parade, visits with Santa, a Christmas tree lighting ceremony and more on Friday. ICE! featuring A Charlie Brown Christmas at the Gaylord National Resort ICE! is a signature holiday attraction open Nov. 16-Jan. 1. Watch Charlie Brown rediscover the meaning of Christmas as the beloved story unfolds through two million pounds of ice sculptures and displays. Cirque Dreams Unwrapped will entertain your family in the Atrium, get festive at the Christmas Village which allows you to decorate gingerbread houses, ice skate, enjoy milk and cookies with Mrs. Claus and more. Downtown Holiday Market– The 14th Annual Downtown Holiday Market is located on the F Street sidewalk in front of the Smithsonian American Art Museum & National Portrait Gallery between 7th & 9th Streets, NW. Bringing a unique and festive shopping “village” to the heart of Downtown DC, the market features more than 150 regional artisans, crafters and boutique businesses of ethnically produced goods. Hundreds of diverse gift items, such as jewelry, pottery, paintings, and textiles will be offered by 60 exhibitors each day. Happy Thanksgiving! Grateful to you all for reading my blog and offering suggestions on how to improve it. Head over to Caravan to download holiday art that you can print and in turn will entertain guests and Bambinos. Place mats, posters, coloring table cloths and more are available for download and all you have to do is send it to a local print shop or use your home printer. We’ve found some simple and fun crafts to help you pass the time while the turkey cooks so the kids don’t make everyone crazy. You can find all of the crafts on our Pinterest page under the Thanksgiving board. In case you have to work on Friday and need to occupy your kids, see the list of several places that have day-off camp. Turkey Hunt– Growing up my Mom enjoyed making scavenger hunts for my brother and I. This is a perfect activity for my toddler (and any aged child) to do while the meal is finishing cooking. 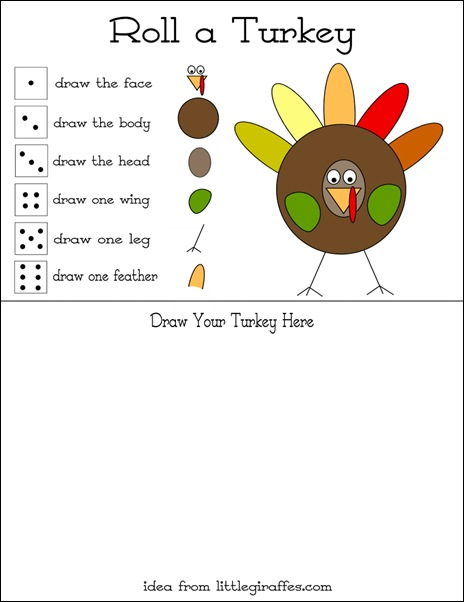 Roll a Turkey– Fun activity for more than one child, they can compare their turkeys once they are finished. Even cuter to use as centerpieces on the table. Handprint Tablecloth– Love the idea of each year having Bambino(s) place their handprint on the table runner or table cloth and adding the year. In addition to my baby girl turning 3 this weekend, there is a lot happening in our area. Find time in between prepping for Thanksgiving to get out to some of these once a year events! Final weekend of The Adventures of Peter Pan at Synetic Theatre. Take flight to Neverland with Peter Pan, his Lost Boys and the Darling children! In this magical place filled with fairies, pirates, and mermaids, Peter Pan and crew will battle the delightfully sinister Captain Hook with acrobatics that will leave you on the edge of your seat! This production is recommended for ages 7+ for moments younger viewers may find frightening. 26th Annual Gem, Mineral & Fossil Show is taking place Saturday & Sunday on the campus of George Mason University. Demonstrations, Exhibits, and Door Prizes. Mini-mines for children to dig in and get free fossils and minerals. Over 20 Dealers with Fossils, Minerals, Crystals and Gems for sale. The Junior League of Northern Virginia’s 17th Annual The Enchanted Forest will take place November 18-19, 2017, at the Westin Tysons Corner. The event will feature live entertainment, Kids in the Kitchen holiday activities, visits from Santa, a model train display, kids’ crafts, gifts for purchase, premium events for adults and kids, and a silent auction of more than 80 lavishly decorated themed trees and wreaths. The Enchanted Forest is your first opportunity to take photos with Santa, get a head start on your holiday shopping, and kick off your holiday season. Back by popular demand, family-friendly circus clowns Pinot & Augustine star in a show jam-packed with physical comedy. Bursting with melodic surprises from the ridiculous to the sublime, our clowns perform their own unique compositions with musical saws and an extra-special inflatable cushion! The streets are being overrun with turkeys, dinosaurs, penguins, and reindeer! No, the zoo hasn’t opened their gates – it is the Annual Montgomery County Thanksgiving Parade! With marching bands, Bolivian dancing groups, floats, giant characters and balloons, and Santa, the Montgomery County Thanksgiving Parade is the only Thanksgiving Parade in the metro DC area. Dance your way to the tip of the African continent! Experience three different African cultures through dance, from traditional Zulu village dances through modern moves with a South African flair. Founded in 2003 by native South African dancer Lesole Maine, the company has performed to acclaim throughout the U.S. and locally at the Kennedy Center, Wolf Trap, Smithsonian and area schools. All ages and FREE. Come celebrate Thanksgiving WITH the turkeys – join our friendly turkeys and all their friends in celebrating a cruelty-free Thanksgiving potluck. Please bring a vegan (no meat, dairy, or eggs) dinner or dessert item to serve 8. $10 suggested donation. Grab the kiddos and join other mamas (and Papas!) for an all-levels vinyasa yoga practice. Grown-ups and older children will move through poses while littler yogis sleep, play and/or explore in a child-friendly (and safe) environment. No prior experience is required. Please bring your mats and a playful attitude. Online registration is available here. Please let me know if you have any questions. The traditional Havdalah* ceremony marks the end of Shabbat and can only happen when there are three stars visible in the sky. Explore the stars and our universe with a live planetarium show, cake-pop treats and crafts! We will end with the Havdalah ceremony, a lovely, multi-sensory experience. Exploring the Sky is an informal program that for over sixty years has offered monthly opportunities for anyone in the Washington area to see the stars and planets through telescopes from a location within the District of Columbia. Sessions are held in Rock Creek Park once each month on a Saturday night from April through November, starting shortly after sunset. Beginners (including children) and experienced stargazers are all welcome-and it’s free! Explore the breathtaking beauty of autumn! We will go on a hunt for autumnal colors by looking both outside on the trees and in paintings in the National Gallery of Art. Ages 13 – 23 months, $43. Workshops offer a variety of hands-on experiences that introduce young children to concepts in engaging ways. Each class includes playful activities that are intentionally chosen to support your child’s development. Our learning extends beyond the classroom and into the museum and community where children and parents are encouraged to wonder and explore together as a family.